KOHLER® residential generators bring a sense of safety, security, and convenience to a home. In your house, generator power can bring light during a summer storm and heat if the power is lost during winter. If you lose power in your community for an extended period of time, a home generator can save you the expense of having to relocate, which means you can continue your day-to-day life in comfort. 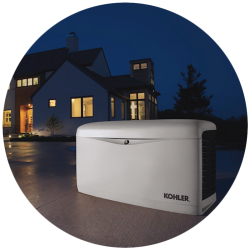 Bay City Electric Works carries a range of KOHLER home generators, from 8.5 to 100 kW output capabilities, designed for large or small homes and whole or partial backup power. No matter what commercial-grade KOHLER residential generator you choose, you get reliable, safe power and the industry-leading KOHLER warranty for life — without interruption. View/download the Top 5 Considerations for Choosing a Home Generator brochure pdf. Since the 1920s, KOHLER has manufactured home standby generators, residential emergency generators, and backup power devices to provide dependable protection during unexpected power outages. KOHLER residential generators provide clean power for sensitive home electronics, fast power to get you up and running, and reliable backup power to ensure your life goes on, even when the utility power doesn’t. This power distribution scenario enables the homeowner to power all devices within the home with the generator, as if they were using normal utility power.